The current resolution of the iPad is 1024×768 that is being increased to 2048×1536 at a 260 DPI, as a report says. Based on the findings by @StroughtonSmith by way of @Xuzz on Twitter, it seems Apple is going to take this pixel-doubled approach again for the iPad 2, no Retina Display here. Version 1.1 of Apple’s iBooks application seems to have accidentally included some artwork for this hypothetical pixel-doubled iPad. 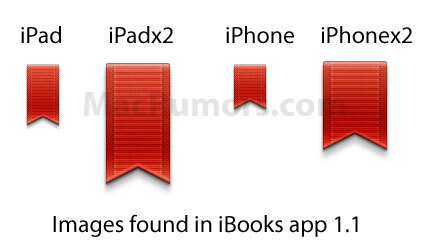 As shown above, the App’s bookmark icon included versions for the iPad, the iPhone and the iPhone Retina Display (Shown as iPhonex2). It, however, also included one additional version labeled as the “iPadx2″. Based on this information, and persistent rumors of a higher resolution iPad 2, we believe the upcoming iPad will have a 2048×1536 screen resolution. It would also explain why Apple would have to upgrade the GPU on the new upcoming iDevices to support this higher resolution.